Welcome to SCVSAR's Peer to Peer and Family Support Team! Peer to Peer Support team members are individuals within SCVSAR who are available and willing to assist their peers with the emotional challenges or concerns often confronting volunteers in search and rescue missions. Family Support team members are specifically trained to assist and support a subject’s family during a mission at incident command. The key traits all team members possess include life experience consistent with a working knowledge of SAR, the ability to be empathetic, a desire to help others, rapport building skills, a strong emotional support system, asking for help when needed and good resiliency skills. It is important to note some very important tenants of these teams. Team members do not discuss or reveal any sensitive information outside of the team unless it is illegal or a threat to life. Team members share responsibilities and we make sure we are communicating, coordinating and supporting one another. Team members work collectively to provide the best service and support to SCVSAR members and subject families. 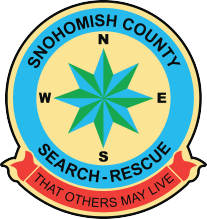 Please contact us at info@scvsar.org to learn more about how you can join Snohomish County Volunteer Search and Rescue!